This statistic shows the total amount of U.S. municipal solid waste generated per person per day between 1960 and 2015. In the United States, an average of 4.48 pounds of municipal solid waste were generated daily per person in 2015. Non-hazardous waste consists of industrial waste and municipal solid waste. Industrial waste is characterized as non-hazardous materials that are generated during the production of goods. Municipal solid waste is what is more commonly known as household trash and garbage. Since the 1960s, the volume of waste generated per person has steadily increased until 2000, when per-capita waste generation seemed to level off slightly. 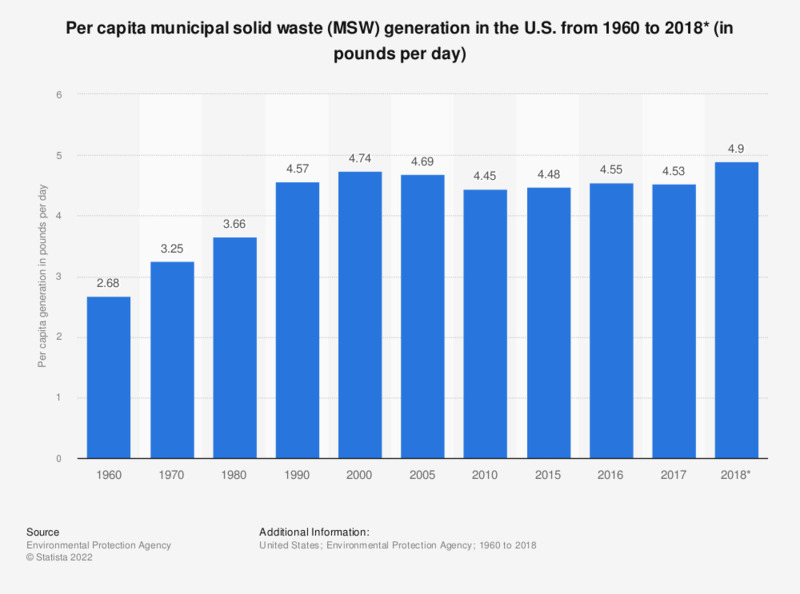 In 1960, municipal solid waste generation per person amounted to about 2.68 pounds per day, and from 2010 to 2015, this figure had leveled out to about 4.5 pounds per day. The composition of household waste can vary widely between different municipalities. Areas with a well-developed recycling program generate mostly plastics and unrecyclable materials. In 2014, about 67.8 million tons of municipal solid waste were recovered for recycling in the United States. A large share of the municipal waste stream is derived from paper and paperboard materials, totaling about 68.1 million tons of waste in 2015. In 2015, about 31.2 million tons of packaging was recycled while 7 million tons were discarded into landfills. In the United States, the Environmental Protection Agency encourages waste prevention, recycling, and composting to reduce the volume of waste produced. Recycling and composting diverts a significant amount of waste away from landfills every year. Everything On "Municipal Solid Waste in the U.S." in One Document: Edited and Divided into Handy Chapters. Including Detailed References.